During Summer of Sonic, we had an opportunity to sit down with Takashi Iizuka, the legendary leader of Sonic Team. Unfortunately, we weren’t able to get a lot of time with Iizuka and had to share the interview, but we think we came away with a really interesting insight into the development of Sonic: Lost World that we’re sure you’ll enjoy! Zone: 0: Sonic: Lost World is quite a brave, new direction for the series. What made you decide to take a new approach to the engine as opposed to furthering the popular engine from in Sonic Unleashed, Colors and Generations? Iizuka: Two years ago, we released Sonic Generations and that was a 20th anniversary title. The intention and concept we had with that game was to compress 20 years of history of Sonic into one game. So it really was reflective of everything that we had done before. At that point, we had already decided our target, as a team, was for the next iteration to do something completely new and innovative. The thing that we really wanted to innovate on and set as a challenge was to improve the forward view action gameplay. With Generations, it was very much go really quickly and avoid all obstacles by sidestepping. We wanted to really innovate on that aspect, and that’s where the innovation of Sonic: Lost World’s you picked up on has come from. According to Takashi Iizuka, Color Powers are now a staple in Sonic titles, and you can expect to see them in the future. SEGA Nerds: Is there any particular reason why Sonic Team and SEGA has decided to bring back the Color Powers from the Color games? Is Lost World meant to be a direct sequel to Colors or a spin-off? Iizuka: To clarify, the story is completely separate from Colors. It’s not a sequel in that sense. 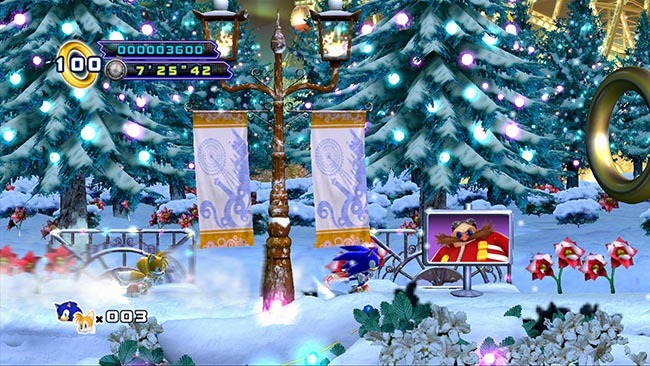 As far as the Color Power implementation, with Sonic Colors, its key unique selling point was its Color Powers. We really like Color Powers as a team, and, moving forward, we intend to make the usage of Color Powers as a standard in future Sonic games as long as it makes matches the playability of the game. Zone: 0: The levels in Lost World seem to be very deliberately more minimalistic in design than in recent games. Does this make them easier to create, and, if so, can we expect to play a larger amount of those stages than normal? Iizuka: Compared to Generations, it’s definitely got a look that’s more minimalistic and simple looking. Why we did that to start with is to make it easier for people to play the game. We wanted to make sure we could maintain 60 frames per second, we wanted to make sure people could see the rings or any sort of thing we wanted people to pick up on – that they can see it without it being too busy in the background. So it’s really a playability thing that we saw was an issue before that we wanted to make sure that we addressed this time. From doing that, actually, now we can create stages with this style a lot faster than before. So there’s an absolute, clear difference in the variation you’ll see in the levels compared to before. SEGA Nerds: In terms of development, how do you find developing titles for fans of the older games and the modern games? Is there a particular method you use to make sure a new game can appeal to both kinds of gamers? 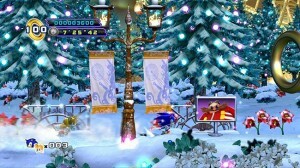 Sonic 4 was Sonic Team’s answer to older fans’ request for an old-school Sonic game. Iizuka: This is something we’re particularly aware of, and it’s something we try to focus on to make sure that we provide something for both different types of fans. In 2010, we released Sonic 4, and that was very much a classically aimed game. Colors was much more for the newer fans. Following up on that, we created Generations, which was looking back at 20 years of Sonic, and that was aimed at both fans because you had classic Sonic and newer Sonic. There was clearly forward view gameplay and side-view gameplay for the older Sonic fans. In Lost World, what we’ve done is carry on the tradition of Generations by providing gameplay in both sidescrolling and forward view, so this title will make sure to satisfy both groups of fans. Zone: 0: Is it fair to say you’re finding it hard to make full use of certain characters like Shadow and Knuckles? It’s been awhile since they’ve had significant roles in a game? Iizuka: Those sub-characters, Sonic’s friends, play a very important role in the universe. We really do want them to shine. For them to really shine, we have to make sure that Sonic himself actually can take the center stage. We wanted to make sure we focused on Sonic and his gameplay first and made sure that was what we focused on. In the meantime, we’ve had games like Mario & Sonic where the other characters have a place for people to enjoy them. It’s not like they’re completely being sidelined at all. SEGA Nerds: How do you find working with the Wii U hardware and the GamePad? 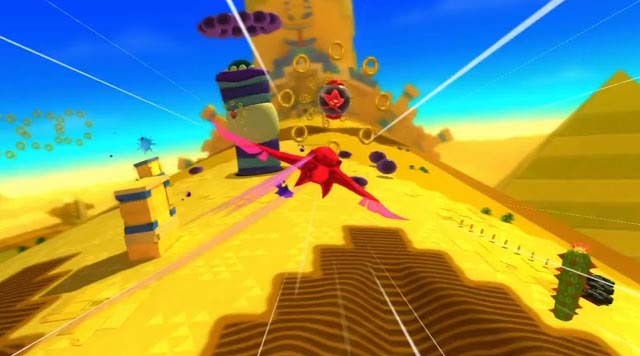 Did Sonic: Lost World benefit from use of the GamePad? 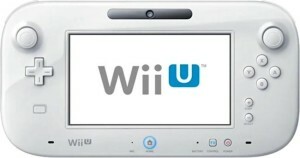 You’ll be able to use the Wii U GamePad during local multiplayer so both players can each have a full screen. Iizuka: With using the Wii U hardware, the clear, obvious advantage is you have two screens. We’ve really taken that and used it to our advantage. There are three main ways we’ve used it. One of the key hardware features that people really seem to love is that people can play the Wii U without having to use the TV screen. So you can play Lost World without having to use the TV screen and play it on your GamePad. The second one is that as we have two screens, we’ve made full use of it by allowing competitive gameplay between two players. Previously, you would have had to split your TV screen in half, and you lost half your screen as a player. Now, you can play one person on the GamePad and one person on the TV, so you can each have a full screen to play. The third is the Color Power actions can be activated through the GamePad. We feel that this use was the most appropriate because it wasn’t like shoehorning in the hardware features into a Sonic game but was a natural fit. To activate the Color Powers, you can use the touch screen to swipe or moving the GamePad.